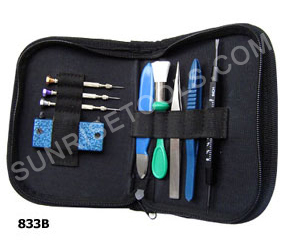 Description :-This kit contains all the essential items for replacement of watch batteries. Comes in leather case for easy storage. Professional Style Tool Kit for watch enthusiasts. Description :-This watch battery changing kit is specifically designed for watch battery replacement of all brand name watches. The tools included will allow you to open the watch back, remove the old watch battery, and find the correct replacement cell. This is an essential tool for watchmaker. 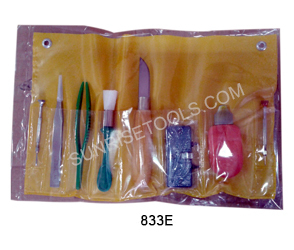 Description :-This deluxe watch repair tool kit comes with everything you need to start working on watches. 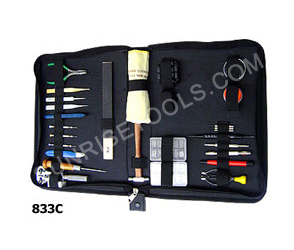 The tools available in this kit will allow you to open most any type of watches and service things like; replacing watch gaskets, replacing watch batteries, replacing watch crystals, replacing watch crown, replacing watch movement, sizing watch band, replacing watch band, replacing or adjusting watch band clasp, fitting watch hands, removing watch band links, and more. 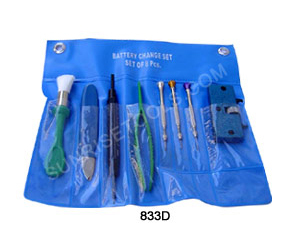 Description :-This kit has everything you need to change batteries quickly. 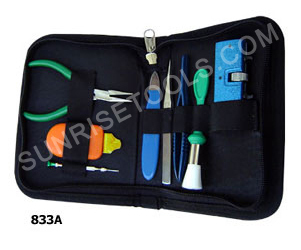 The tools included will allow you to open the watch back and replace your watch batteries. Everything comes in a convenient Vinyle Pouch.